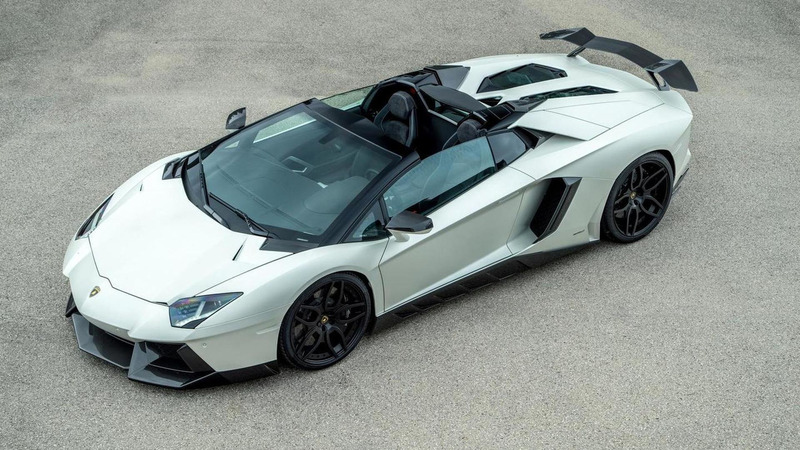 Novitec has presented its comprehensive tuning program for the Lamborghini Aventador Roadster. Starting with the design, the vehicle has received a modified front bumper with two-piece front spoiler integrated and redesigned air intakes. On the back there is a new wing raised by a special control unit below speeds of 180 km/h to “ensure venting of the engine bay”. The Novitec package also includes a set of three-piece 20- and 21-inch alloy wheels. Inside the cabin improvements include “clear-coated carbon-fiber components” ranging from door panels to the instrument cluster cover, as well as new leather seats. Thanks to a new performance exhaust system and recalibrated engine electronics with special mapping for injection and ignition, the power output of the Aventador LP 700-4 Roadster has been increased to 728 HP (535 kW), while peak torque is 709 Nm (523 lb-ft). Customers can choose from versions with or without active sound control - controled at the push of a button in the cockpit.